HAMTRAMCK, Mich. — Borders are a slippery concept, one that seems to exist only in theory most of the time, but occasionally manifests in reality dramatically. Hamtramck — one of two cities within the city of Detroit (the other being Highland Park) — has acted for centuries as a locus for immigrant populations: German and Polish, historically, with a shift more recently toward Middle Eastern and Indian populations that create a potent mix of cultures, as first-generation immigrants make something of their old home in the new land. For people coming to a new country, borders perhaps represent something rather more dramatic than lines on a map. The Porous Borders Festival, the ambitious brainchild of The Hinterlands Theatre Ensemble, whose headquarters, Play House, is located in the ambiguous Benglatown neighborhood — technically a part of Detroit, but much more like the adjacent streets of Hamtramck in its diverse and dense population. 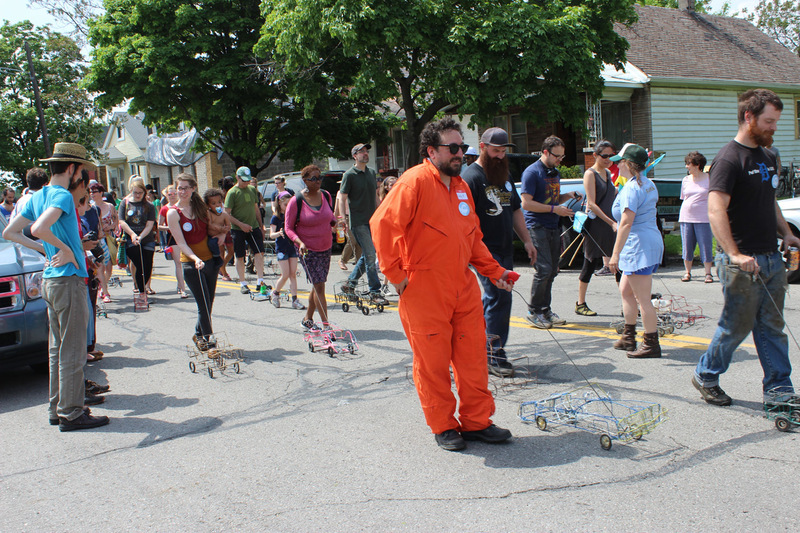 In a burst of inspiration or madness, Hinterlands organized a festival that explores the cultural relationships along the borders between Hamtramck and Detroit, as well as the wider concept of borders as a point of division or solidarity. Festival activities centered on Carpenter and Conant, the two busiest and least industrial of the ten bordering streets. 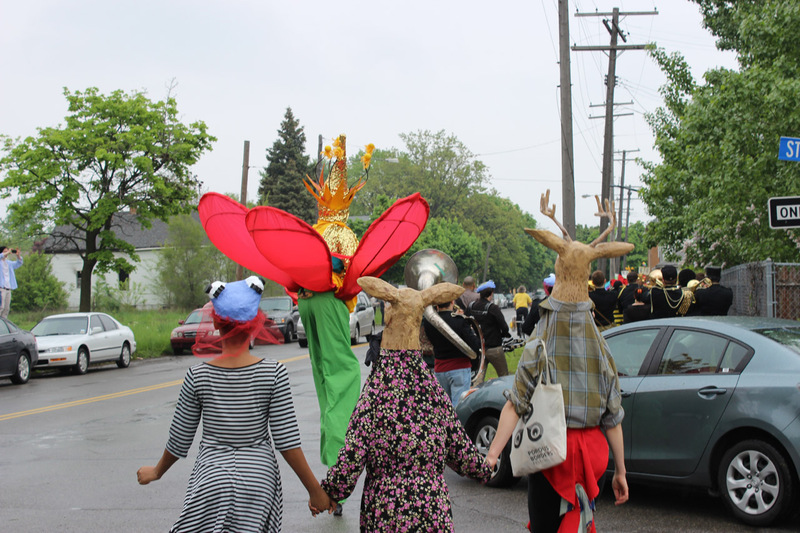 A massive array of roving performances, installations, sporting events, and art activities took place, executed by dozens of contributing artists from Hamtramck and Detroit. I had a chance to catch up with organizers Liza Bielby and Richard Newman during Sunday’s “Car Wash Conversations,” where patrons of the M&M Soft Cloth Auto Wash on Conant were offered free auto-vacuuming service by the duo, in exchange for a border story. “So that guy’s grandfather is head of the Russian military,” said Newman, coming over to where Bielby was giving my auto interior the detailing of its life, “And in order to become a man, he had to kill a bear with a knife.” Conversations like these were happening all over Hamtramck throughout the weekend, as residents were brought together in a series of unlikely events, including a pop-up nail salon, cricket lessons, and a competitive oil-change race between A2Z Auto Center and The Mechanic Shop, Inc. Artist Toby Millman organized the “Porous Borders Poster Project” with collaborator Andrew Thompson, which provided screen printing lessons and empty signage for visitors to personalize and post. Millman shared this moment: “I met an older man, who drove out with his two small grandkids from Southfield. He told me that he had lived in Hamtramck over 50 years ago when the place was all factories and they were going on strike all the time. His grandkids spent at least an hour or two drawing on their signs and billboards and when the little one got bored, she did chalk drawings on the parking lot asphalt that we were sharing with the Bangla Driving School.” Hamtramck is fiercely committed to its history, with most residents and former residents carrying hardwired memories of the sights and sounds of their time there, while also constantly experiencing new turnovers in population. Porous Borders represents a blending not just of the physical borders between places, but the temporal borders between eras and memories. Feel-good was the vibe for the whole weekend, which saw the reunion of Frank Pahl’s automatic music group — formerly “Only a Mother” now redubbed as “Only a Quartet” — turning in its first collective performance in 20 years. According to one onlooker, the palpable joy in “getting the band back together” permeated the performance and all its attendees. 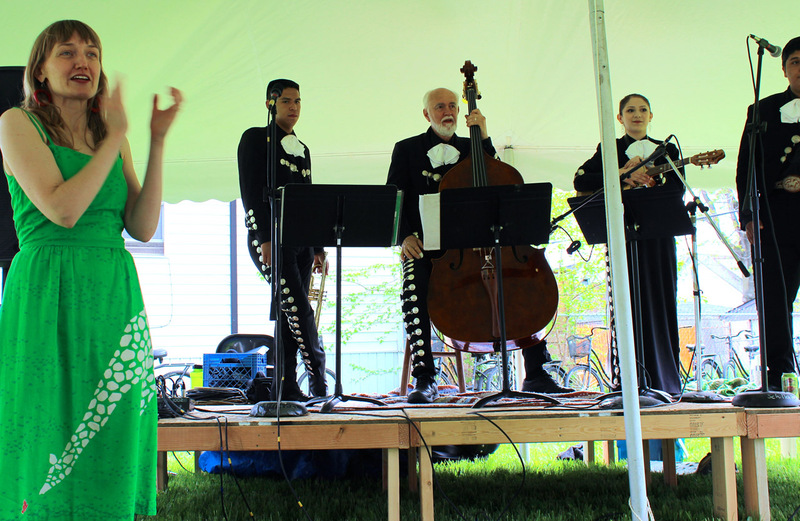 A folk-rock stage organized by local favorites Lac La Belle sought to widen the definition of “folk music” from the Anglo-centric Appalachian variety, and included a traditional Aud player and juvenile mariachi band. A second parade was the cornerstone to Sunday activities — a parade of wire cars, a tradition that organizer Chido Johnson brought from his native Zimbabwe that featured dozens of artists and neighbors walking their creations — including pick-up trucks, Jeeps, tanks, a classic Camero, and a rendition of Cinderella’s carriage rendered in wire and “pulled” by a pink plastic horse — down Carpenter Street. The transference of a cultural tradition between two such disparate countries embodied the very essence of Porous Borders, and prior to the parade kickoff, Johnson delivered a live interview on Zimbabwe radio station, which sent an international shout-out to the paraders. These were just a minor cross sample of the outstanding events of the weekend, part of a festival that Liza Bielby cheerfully but emphatically states, “We will never, ever do again.” On my way home from Hamtramck, I found myself searching for visual markers of the festival, only to discover details from Hamtramck’s everyday tapestry — a child’s portrait on a restaurant sign, the decaying monument to the 1980s that is the White Star Nightclub, the rising notes of the daily call to prayer — and realizing that for anyone with the ability to observe their surroundings, the Porous Borders Festival is an ongoing activity. The Porous Borders Festival took place May 16–17 along the Hamtamck/Detroit border.